In 1986 Andy Warhol created the Cowboys and Indians portfolio. 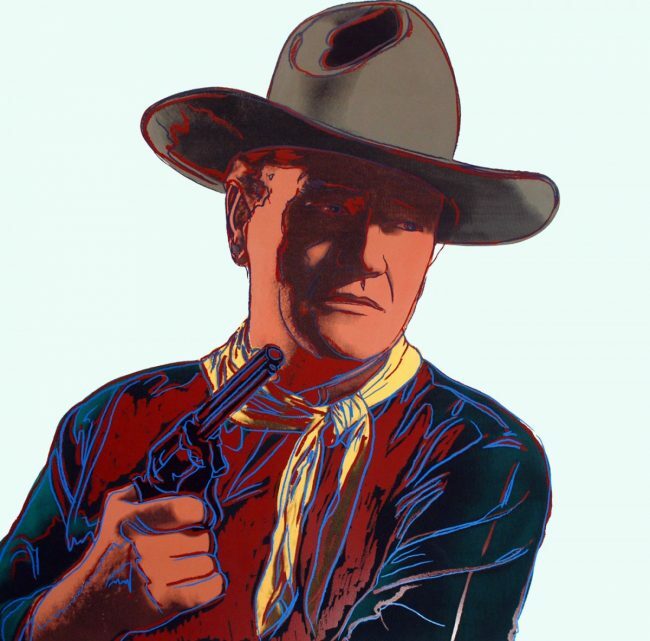 In this portfolio, Andy Warhol depicts the popular version of American Western history. Strategically placing icons such as General Custer, Annie Oakley and Geronimo together in one portfolio, these ten silkscreens by Andy Warhol are intended to challenge and expose the controversies surrounding America’s perception of cowboys and indians. John Wayne was an icon representing the macho leading man in Hollywood’s heyday. He was fixture in westerns and war movies alike, an All-American hero. The allure of celebrity myths and legends lead Warhol to create the Cowboys and Indians series in 1986. The source image is a publicity photo from the film The Man Who Shot Liberty Vallance(1962). In this image, the celebrity status of John Wayne completely overshadows the actor’s real identity, Marion Robert Morrison. In the movie, a reporter takes the story of John Wayne’s character back to his editor and is told, “This is the West, sir; when the legend becomes fact, print the legend.” In this series, that’s what Warhol did. Warhol interspersed recognizable portraits of well-known American “heroes”–John Wayne, Annie Oakley, Teddy Roosevelt, and General George Custer–with less familiar Native American images and motifs in his ironic commentary on Americans’ collective mythologizing of the historic West. Rather than portraying Native Americans within their historical landscape or Cowboys in their veritable forms, Warhol chose to portray a popular, romanticized version of the American West. The West that he chose to represent is familiar to everyone and can be seen in novels, films, TV series. Warhol’s Cowboys and Indians Suite is an ahistorical representation that mirrors a popular interpretation of the American West. Andy Warhol created the Cowboys and Indians series during the mid-1980s, arguably his most prolific period. During this time, Warhol was forming bonds with a number of younger artists in the New York art scene including Jean-Michel Basquiat, Julian Schnabel and David Salle. Warhol saw a re-emergence of critical and financial success during this period of his life.